Welcome to Red Couch Recipes and to my Watermelon Tablescape! What says summer more than WATERMELONS? They are bright, red, fun, and juicy -- all these things describe summer. 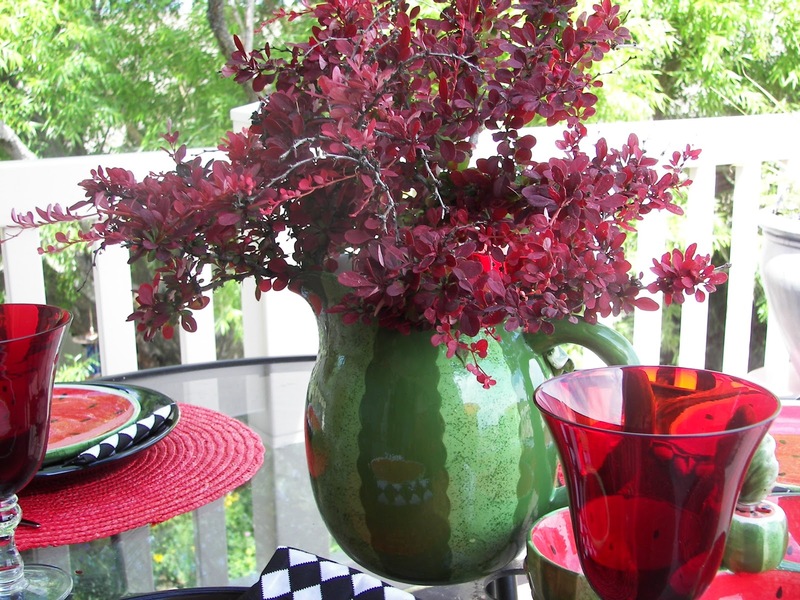 I filled the watermelon pitcher with some Barberry bush branches. Here's a full table view. And another...I love how the black and white napkins add some "pop" to this table. 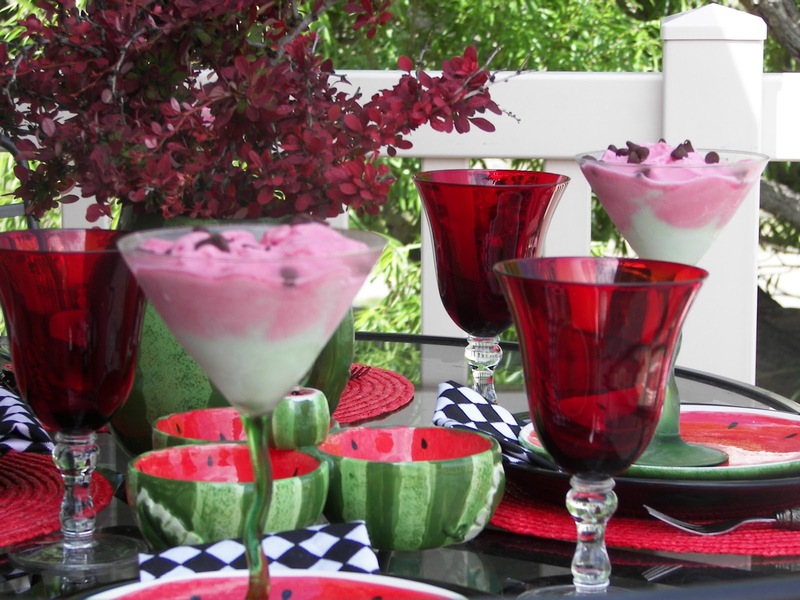 Are you ready for some refreshing watermelon dessert. Trust me, it's tasty, cool, and refreshing. My children and I ate dessert before dinner tonight. See, we didn't eat them all, we saved you some. Thanks for dropping by (or drooping if you are hot) my Red Couch where it is rainy and cool today in the high desert. That's a darling table. 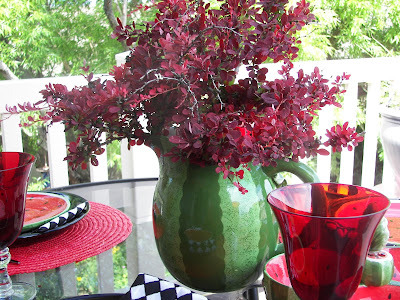 I love the barberry in the watermelon pitcher. Are you going to share the dessert recipe? 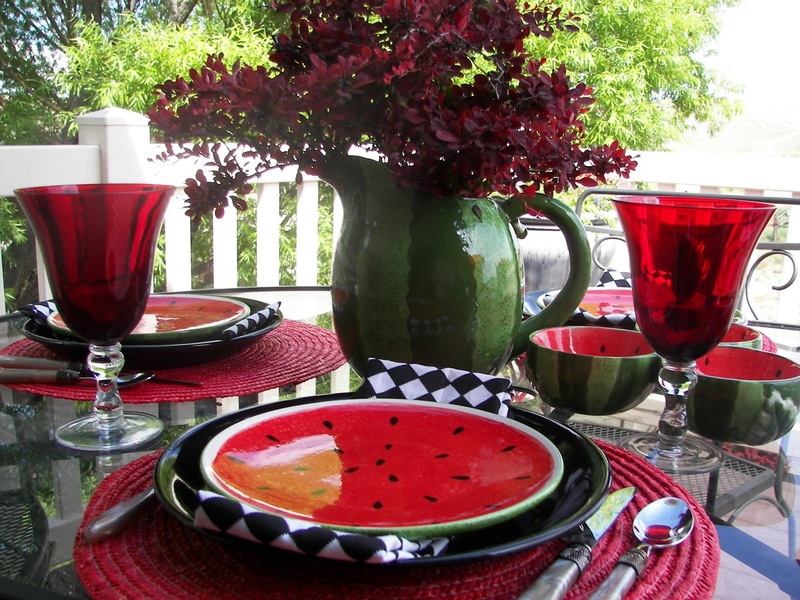 Love this color combination on the table and the watermelon theme is just perfect! Great job Joni! I am not even a watermelon fan but I love this. I may have to go on the hunt for some watermelon plates now! Fantastic tablescape Joni. It's just perfect for summer. A perfect summer tablescape! I love how the black & white napkins add a twist. Mmmm...your dessert looks delish. I LOVE the black & white checkered napkin on there!!!!! That really rocks!!! Really fresh! Great Summer tablesape. Love the watermelon plates and bowls and the dessert look sooo cool and refreshing. Great tablescape and thanks for the cool wishes. It's so hot here. Love it, especially how you mixed and matched with the napkins. Want to try that dessert NOW!!! oh i meant to say I want dessert! it looks scrumptious. That's a pretty table! We have watermelon once a summer and we always ask ourselves why we don't have it more often. This is so cute, right on down to the dessert. I hope you're going to show us how to do it. I love the choice of the black and white napkins with this. I wouldn't have thought of it, but they are perfect. I did a watermelon tablescape a few weeks ago and had great fun with it, so I couldn't wait to see yours! You did an amazing job! I think watermelon says "summer" in such a big way! What a happy, delicious fruit. And what a charming table! Beautiful! I love everything and ghat dessert looks delicious. 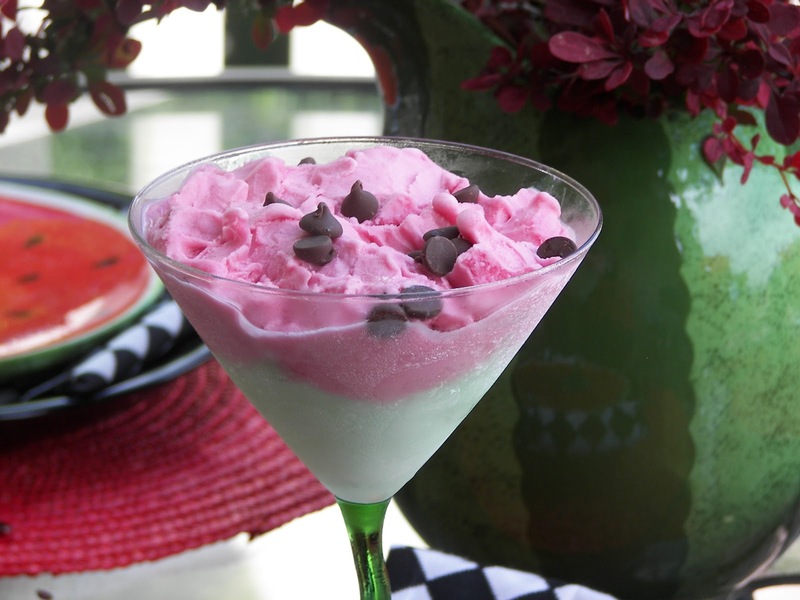 Is it layered sherbet sprinkled with chocolate chips? How clever! I'd love to know how you made that refreshing dessert. The tablescape is charming. The watermelons are sooo lovely. 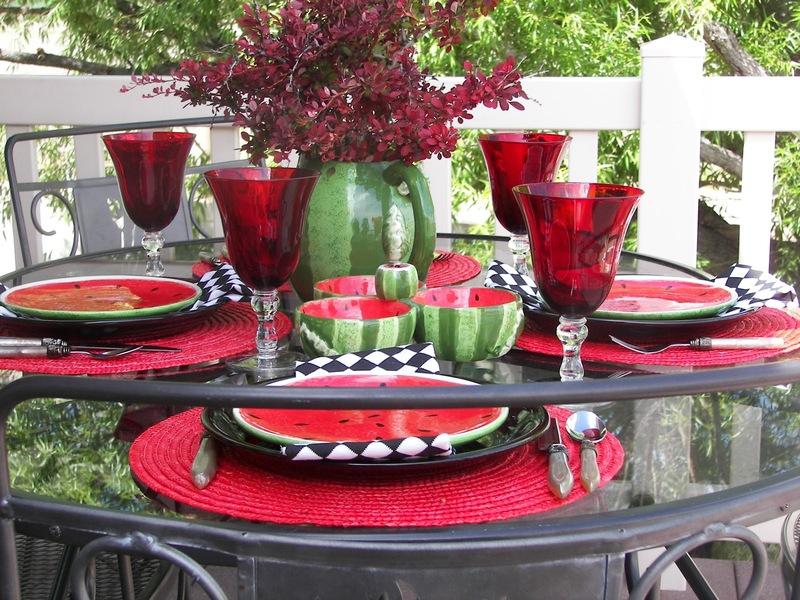 Great watermelon tablescape!. 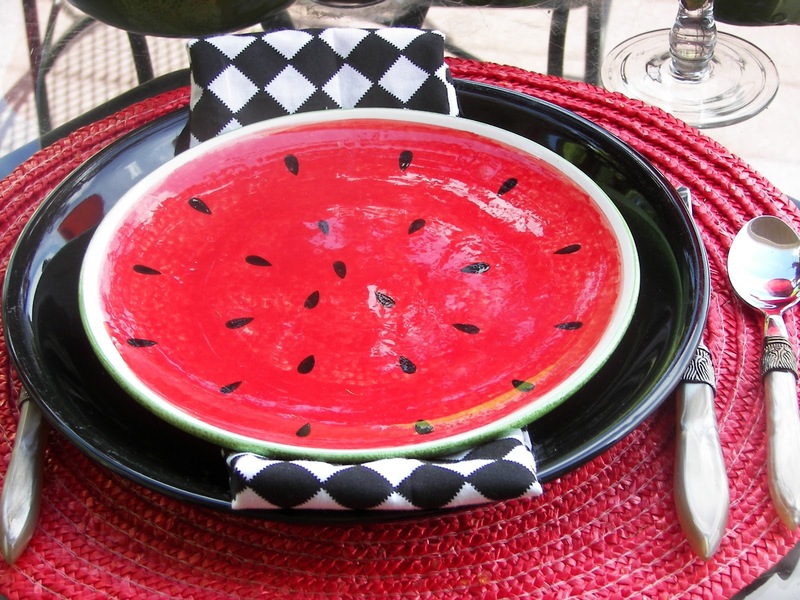 I love the checked napkins and the black plates; the look really pulls out the red and green of your watermelon pieces. Beautiful! How fun! Who wouldn't love a watermelon tablescape! Love how you've mixed it up for your delightful table. Fantastic table and what a great desert! Now I'm really looking forward to summer...oh how I love watermelon! Hope you have been well and enjoying summer. Best wishes for a fabulous weekend! vERY PRETTY LOVE ALL THE COLORS THEY ARE DIVINE. THANK YOU...THE SHERBERT LOOKED GOOD AS WELL. HAPPY SATURDAY. What a fun table. That watermelon pitcher is great. Can you believe for years and years I didn't like watermelon? Now I love it. The whole table is delightful, and I would love to start with dessert first too! 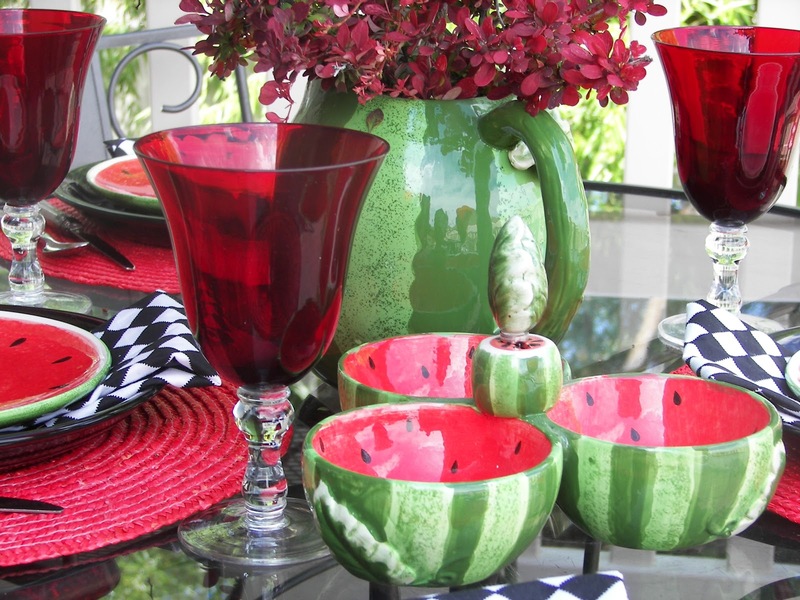 Watermelons are the perfect summertime fruit to base a tablescape on and you've captured the colour and fun terrifically! Love the dishes and the centerpiece you created using the pitcher. Just looking at that dessert makes me feel refreshed!